Shadow Banking in China examines this rapidly growing sector in the Chinese economy, and what it means for your investments. Written by two world-class experts in Chinese banking, including the Chief Advisor to the China Banking Regulatory Commission and former Chairman of the Securities and Futures Commission in Hong Kong, this book is unique in providing true, first-hand perspectives from authorities within the world's largest economy. There is little widely-available information on China's shadow banking developments, and much of it is rife with disparate data, inaccuracies and overblown risks due to definitional and measurement differences. This book clears the confusion by supplying accurate information, on-the-ground context and invaluable national balance sheet analysis you won't find anywhere else. Shadow banking has grown to be a key source of credit in China, and a major component of the economy. This book serves as a primer for analysts and investors seeking real, useful information about the sector to better inform investment decisions. Despite shadow banking's critical influence on the Chinese economy, there have been very few official studies and even fewer books written on the subject. Understanding China's present-day economy and forecasting its future requires an in-depth understanding of shadow banking and its inter-relationship with the banking system and other sectors. 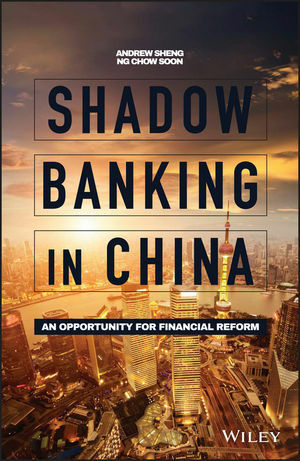 Shadow Banking in China provides authoritative reference that will prove valuable to anyone with financial interests in China. ANDREW SHENG is chief adviser to the China Banking Regulatory Commission, former chairman of the Securities and Futures Commission, Hong Kong and deputy chief executive in HKMA. NG CHOW SOON is the former director of the governor's office, Bank Negara Malaysia and a Harvard Mason Fellow.